. :: EQUIST NEW FACE OF HORSE & EQUESTRIAN WORLD ::. HAVING BROUGHT TURKISH AND INTERNATIONAL HORSE BREEDERS TOGETHER FOR THE FIRST TIME LAST YEAR, EQUIST HORSE AND EQUESTRIAN FAIR IS GETTING READY FOR EXCITING NEW OPPORTUNITIES FOR ITS PARTICIPANTS THIS YEAR. 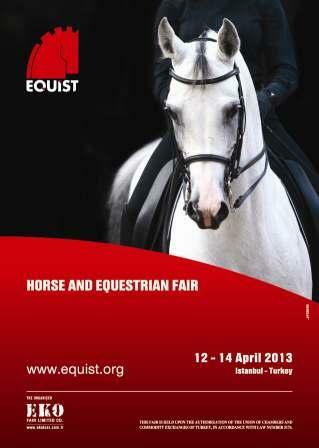 THE EQUIST TEAM HAS ACCELERATED AND EXPANDED THE FAIR WITH THE GREAT SUPPORT, INTEREST AND GUIDANCE OF ITS EXHIBITORS AND IS NOW LOOKING FORWARD TO THE SECOND FAIR, WHICH WILL BE HELD ON 12-14 APRIL 2013 AT ISTANBUL EXPO CENTRE, TURKEY. Animated by shows, expositions, conferences, special offerings, guests and exhibits of a wide range of products, the first edition of EQUIST attracted great interest. The fair went far beyond its original expectations with 7,570 visitors from 21 different countries including UAE, Spain and Russia. EQUIST 2012 was also quite remarkable for its rate of international exhibitors; 49.4% of the international exhibitors were from 15 countries. The biggest international participation rates were Germany, France and UAE. 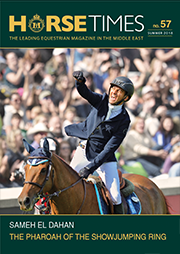 Gathering the various equestrian sport, product and breeding interests from various parts of the world, EQUIST has become the global face of the Turkish equestrian industry. The most important and established brands in the horse and equestrian industry entered markets of Turkey, the Middle East and Central Asia. At the same time, the new and emerging brands of these markets also had opportunity to present themselves. Thanks to EQUIST, a significant number of business cooperation and representation agreements were arranged. It is worth noting that the Turkish economy is one of the largest and fastest growing economies. In the last quarter of 2011, Turkish economy has grown an impressive 5.2%, its agriculture has grown 6.2% and this growth has been recognised throughout the world. It is the same situation in the equestrian industry. Just 7 years ago, the equestrian sector had a value of 1 billion TL; today it has 2.7 billion TL value. These days, around 15,000 horses are maintained in the professional horse riding and racing sectors. In those sectors, 5,000 horses race and 4,000 foals are kept, and an estimated 5,000 pregnant mares and 500 stallions exist. Although references vary there are an estimated 17,000 thoroughbreds and 14,000 Arabian horses. About 30,000 people are employed in the care, sheltering, training, feeding and transportation of these Arab and British origin horses as well as in the racing industry. While the number of bookmakers is around 2,500, there are horse races in seven cities, all year round. Estimations of around 300,000 people earn their living in Turkey through occupations related with horses.